Champlain and Sandford R.R. Between Streetroad and Addison Jc. 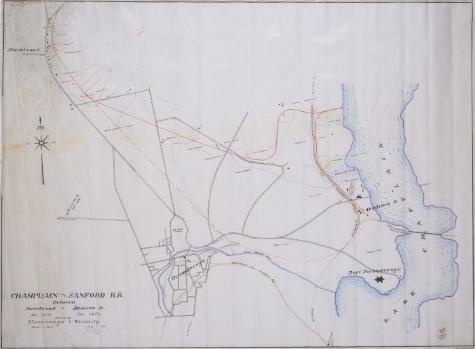 Map of the Champlain and Sandford Railroad, from Addison Junction on the Lake Champlain to Streetroad. Includes drawbridge over Lake Champlain. Scale of one inch equals three hundred feet. Source: Adirondack Museum Library, MacIntyre Iron Works records, MS 65-27, box 4, no. 22.